SteamOS users with AMD and Intel graphics processors will be happy to know that the latest update to Valve's operating system adds full support for their GPUs. Previously only users with Nvidia graphics could install SteamOS, which is still in beta. 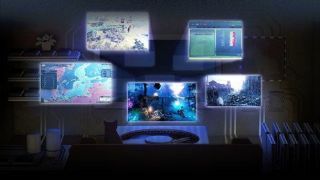 This update to the "alchemist" build of SteamOS also includes the latest update to AMD's Catalyst driver, and fixes general "poor in-game performance" and problems with the return-to-desktop function, according to a post by Valve's Pierre-Loup Griffais. However, there are still known issues with screen tearing and poor performance of the Steam overlay while in-game. Griffais asks that users post their feedback to the SteamOS forum. Valve said in a forum post that this SteamOS update should go out automatically to existing SteamOS users. The alchemist update also fixed the Steam controller upgrade process, corrected an issue with Trine 2's audio, and made other changes. However, Valve noted that users with "Optimus" solutions, where the PC dynamically switches between integrated Intel graphics and discreet Nvidia graphics, are not yet supported. For more on SteamOS, read everything to know about Valve's operating system. The Xbox was the original Steam Machine - but is Valve's approach really a new dawn for PC gaming?